Clique’s fashion and retail resource Who What Wear is the ultimate destination on Instagram for the fashion obsessed. With a dedicated community of well over 2M, a timely and engaging paid social strategy is an important part of Who What Wear’s growth tactics. So it only makes sense that the paid social team at Clique turns to Dash Hudson’s Story Studio to elevate its Instagram Stories advertising. Why Who What Wear ads created in Story Studio drastically outperform typical creative. How Dash Hudson's Story Studio allows brands to customize ads, be creative, and A/B test Instagram campaigns. 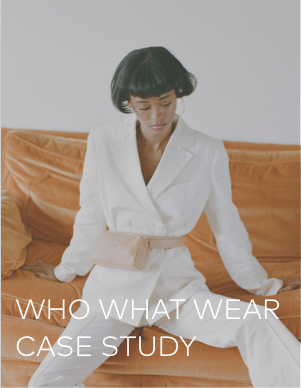 Who What Wear’s approach to tactfully creating ads in Story Studio to drive ROI, boost engagement, and increase readership. Download the case study to enhance your ad strategy.